Deadpool Christmas Sweater is as Hideous as the Hero Himself | Nerd Much? As we approach Christmas season, there are a lot of ugly Christmas sweaters out there that are vying for your attention. You could rock one that represents Harry Potter. You could go safe and purchase one that represents one of the many Disney franchises. Or, you could even go the ultimate nerdy route and nab one that features an iconic video game series. But really, the ultimate Christmas sweater is one that is as ugly as the series’ main character itself. And for that, the Deadpool Christmas sweater is here. The Deadpool Christmas sweater sports an intarsia design with the character’s comic logo dead center. It’s mostly red throughout (like Deadpool’s costume), but features holiday accents of black and white patterns throughout (like Deadpool’s costume). 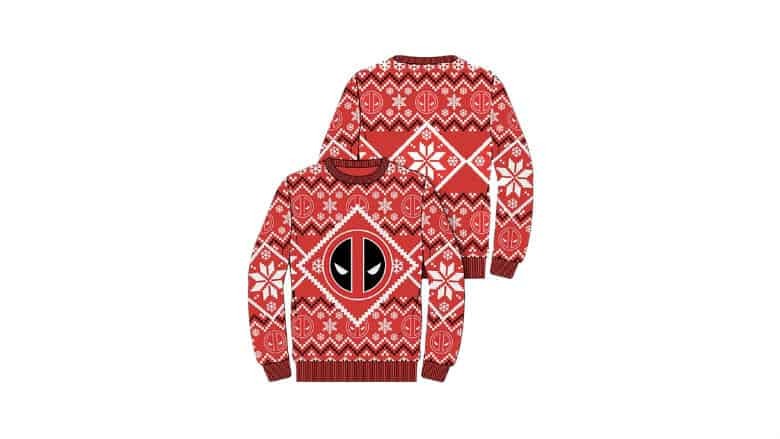 Fun.com is the retailer offering this awesome Deadpool Christmas sweater. They have it listed for $49.99. Orders over $65 qualify for free shipping, so if you take on a little something extra for yourself then you’ll save money in transit by doing so. “Looks like it’s that time of year again. Are you ready? Are you stretched, centered, and ready to run with a stomach full of pie? The holidays can throw all sorts of hurdles your way and you’ve got to be ready for all of them. Sure, you might not be dodging bullets and hanging from speeding cars, but there are plenty of other dangers out there. You can head to Fun.com right here to pick up a Deadpool Christmas sweater of your very own.